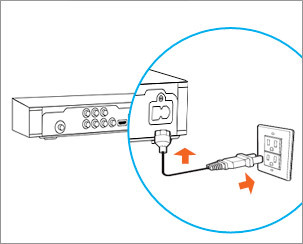 Secure all connections between your receiver and the wall outlet, starting with the SAT-IN (or SATELLITE IN) connection. If you have any adaptors connected, please secure them as well. You may have a SWiM Adaptor (pictured above) attached to the DIRECTV cable coming from your dish. 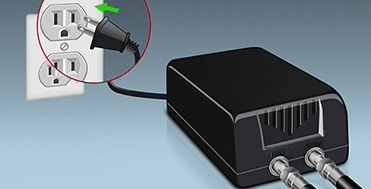 Unplug it from the electrical outlet, wait 15 seconds, and plug it back in. Note: Do not plug in the SWiM Power Inserter to a power outlet that can be turned off. 771 is an error code that means your receiver is having trouble communicating with your satellite dish, which may interrupt your TV signal. In rare instances, this might be caused by a severe storm. If you are experiencing heavy rain, hail, or snow, please wait for it to pass. If there are no sever weather conditions in your area, proceed to the steps below. If there are no severe weather conditions in your area and you’re seeing error 771 on ALL of your receivers, call 800.531.5000 for assistance. If only some receivers are affected, but not all, follow the steps below. You need to be home to troubleshoot. 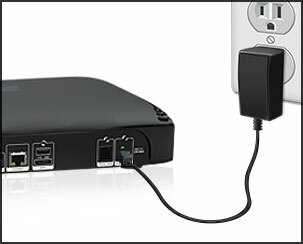 Secure all the connections between your receiver and the wall outlet, starting with the SAT-IN (or SATELLITE IN) connection. If you have any adaptors connected to the cable, please secure them as well. Step 2. 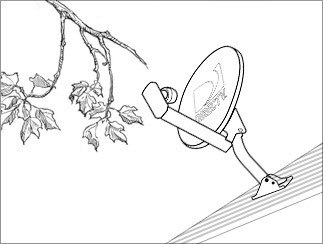 Check for Dish Obstructions: If you can easily see your satellite dish, verify there’s nothing is blocking the line of sight from the dish to the sky. DO NOT climb on your roof. If you believe there is something interfering with the signal, please contact us. Step 3. Contact Us: Call 1-800-531-5000 and say “771” when prompted. Watch on Your TV: Watch your recorded shows. 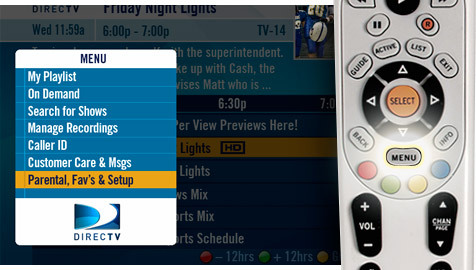 Press LIST on your remote control to view your DVR playlist. If your HD DVR was connected to the Internet before the outage, you may be able to enjoy the latest movie releases on DIRECTV CINEMA (Ch. 1100), plus thousands of titles On Demand (Ch. 1000). How do I reset my DIRECTV receiver? 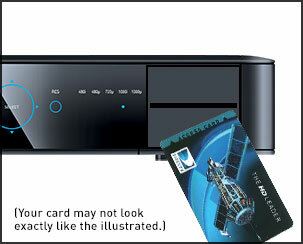 On some DIRECTV receivers there is a red reset button located inside the access card door on the front panel. Press it, then wait for your receiver to reboot. 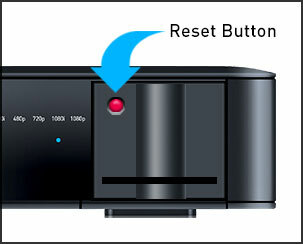 Note: On some receiver models, the reset button is on the side of the receiver. Press the Power button on the front panel of your receiver. Wait for your receiver to reboot. What is SAP and how does it work? Your DIRECTV service includes SAP (Secondary Audio Programming), which allows you to enjoy English-language programming in several different languages. The language you select on-screen will become the default language for all of your programming and will activate automatically whenever SAP is available. 24-hour SAP channels include Boomerang, Disney XD and Cartoon Network. 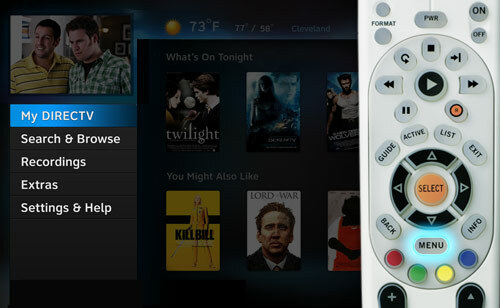 Many of the movies on DIRECTV CINEMA™ have the SAP functionality. Many of DIRECTV’s premium channels also offer shows and movies with SAP (see below for complete list). Other channels offer SAP on a show-by-show basis. If a particular program is SAP enabled, it will be indicated in the program description that appears on the channel guide. To use the SAP function, press the GREEN button on your remote control. The channel you’re trying to watch is not included in your programming package. Your receiver is not processing the programming information on this channel. To resolve the issue yourself, follow the steps below or watch the video. Still seeing Error Code 721 on your TV screen? Try Solution 2. STEP 1: Sign in to your DIRECTV online account. 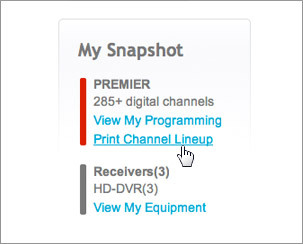 STEP 2: On the My Overview page, click Print Channel Lineup. STEP 3: If the channel you’re trying to watch is not included in your programming package, click Change Package to easily upgrade your package. Still seeing Error Code 721 on your TV screen? Try Solution 3. 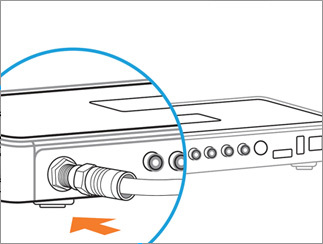 STEP 1: Unplug your receiver’s power cord from the electrical outlet, wait for 15 seconds, and plug it back in. STEP 2: Press the Power button on the front panel of your receiver. Wait for your receiver to reboot. STEP 3: Go to My Equipment to refresh your receiver again. Still seeing Error Code 721 on your TV screen? Please call 1-800-531-5000 for assistance. Many issues, such as missing channels, can be fixed by “refreshing” or “reauthorizing” your receiver. Please visit the My Equipment page and then select the “Refresh Receiver” link next to the receiver you’re having trouble with. Please note: Your service might be interrupted for a few minutes. If your receiver is not fully functional within 5 minutes after your refresh request has been submitted, please call us at 1-800-531-5000. This error occurred because your receiver wasn’t able to download the guide information from the satellite for more than 3 hours. Is the issue happening at your Genie Mini location? Select Run System Test. This may take a few minutes. If no codes are returned, then the receiver temporarily lost communication and normal functionality should return shortly. Open the access card door on the front panel of your receiver and remove the access card. Reinsert the access card. The chip should be facing down with the logo or picture facing up. Still seeing the error message? Remove the access card from your receiver. Insert the access card into the receiver. Please call 1-800-531-5000 for assistance. Press EXIT on your remote control to stop the playback of the recorded show. Tune to the channel the show was on. Still seeing the error message? Please try the solution for live shows above.